Our purpose: to promote literacy, conservation of wildlife and wild places, the movement arts, and to open doors of opportunity for women and girls. 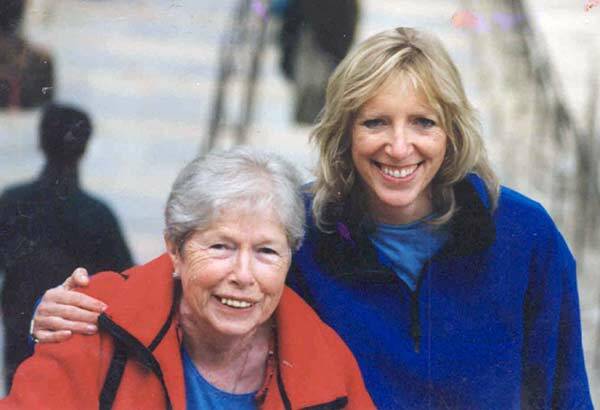 We came together to honor Meriama, nee Mary Bowrin, and to bring her energy – full of curiosity and wonder and a deep caring for people and the planet – into the world. Meriama Fund takes inspiration from her ability to create community and her drive for social justice, in our support for work that fosters real and positive change. It was often said of my mother that she could make six new friends if you left her at a bus stop for 10 minutes. She loved books and read everything. She loved to travel and Nepal and India were heart places for her. When she turned 80, I asked her what she wanted for her birthday. She said, a trip to South India, and off she went for a month, often riding on the back of her guide’s motorcycle. A dream fulfilled – Meriama, delighted, at the top of the 300 long steps up to Syambunath Temple in Kathmandu.